Today’s modern, high performance windows are designed to be more air tight, and energy efficient than ever. To deliver the maximum performance they must be installed plumb, level and square — usually in an opening that isn’t. That requires shimming and adjustment on site. Once traditional shims are in place and the windows are anchored to the substrate — that’s it. No more adjustment. Walls settle. Construction materials dry. Insulation expands. Finish carpentry can warp put stress on frames. If you can’t make a final adjustment, the window won’t work right. A world-wide leader in fastening systems technology has designed an anchor system for wood, pvc, and fiberglass lineals that allows precision positioning during installation, and allows precision adjustment whenever it is needed. And now it's available in US through AWDI. Drill one hole, insert the ShimCon with its plug, tighten and the ShimCon “snaps” into place locking into the wall of the lineal. 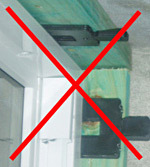 Now when you turn the ShimCon to tighten, the frame moves towards the wall of the cavity. Turn the patented ShimCon counter-clockwise, and the frame moves away. Perfect, precision shimming with ShimCon. Imagine being able to align the frames of a window — no matter how big — into perfect plumb, level and square. With ShimCons, you will be able to deliver the performance built into the window, built into the wall. ShimCons meet and exceed all anchoring requirements, including Miami/Dade.